ME: I know you think you’re tall, you just make yourself look big. Like a cat. NICK: Or one of those bullfrogs. ME: They only do that to attract girls. You better not be trying to attract girls. NICK: You’re already fully attracted? ME: Yes, I suppose that is a legitimate interpretation of what I just said. Well done. ME: Don’t flick that at me! ME: And don’t make that noise! I’m only asking that you don’t wildly fling daddy-long-legs in my direction. NICK: I suppose that is fair enough. 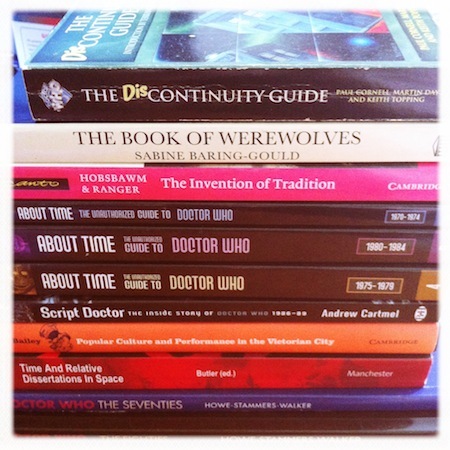 It’s taken me a while to work out a means of blending my rampant Doctor Who fangirlishness with my research. Don’t get me wrong: I’m jolly glad I never decided to do a thesis on Doctor Who . But I am a bit surprised I didn’t hit this vein of research earlier. After all, if you’re going to be a fangirl, at least you can be a productive fangirl. ME: No, bear with me here. NICK: I think I’m going to have to. NICK: I don’t know what we’re going to do, Treen. ME: Other than you getting on a chair and changing the battery? NICK: Yes, other than that. ME: We’re just going to have to kill it with fire. Oh, wait! ME: It’s a fire alarm. ME: It’s probably immune to fire spells. NICK: Oh yeah. It would be. Another fine plan up in flames. ME: I look vastly paler when I’m standing next to you. NICK: You really shouldn’t be so pale. It’s not healthy. ME: Maybe you shouldn’t be so pink. Have you thought of that? Maybe that’s not healthy. NICK: I am ruddy with health! I imagine. ME: This bus still hasn’t left. Maybe I did die in that coughing fit earlier. Maybe this is Purgatory. NICK: Does that mean I’m in Purgatory too, since I’m getting these texts? ME: No. It just means we have really good coverage. ME: Could you do me a favour, since I’ve just noticed that you’ve apparently started throwing your used tissues under your desk? NICK: Oh, that’s been there for ages. ME: You do realise that doesn’t really ameliorate the situation, right?